Experience London like a local on this private 2-hour walking tour and maximize your time with a custom-made itinerary. 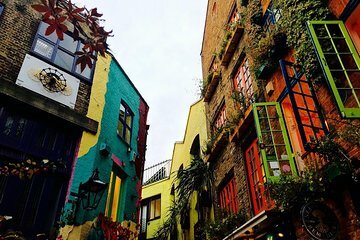 Perhaps check off famous landmarks such as Buckingham Palace, Big Ben, and the Tower of London; discover neighborhoods like Soho and Covent Garden; or get insider tips on where to shop, dine, or party in the city. Sean-Taylor Williams was my host. He showed me the city of London while also providing me with the history and interesting facts about each location. In one day, we thoroughly explored Brixton, Soho, Camden and other places. see pictures After my tour with Sean-Taylor, I was able to effectively navigate the Underground to go anywhere I needed to go in London. Sean-Taylor is extremely personable and knowledgeable. I am so glad I started my trip with Sean-Taylor, working with Sean-Taylor set the precedent for an outstanding experience in London. Whenever I travel to a new place I will use CityUnscipted to book a tour with a Local to start my trip.